How common are airplane bird strikes? After a Southwest flight bound for Houston was forced to land after striking a bird, Ted Oberg Investigates looks into the frequency of bird strikes at major airports. HOUSTON (KTRK) -- Passengers on a Southwest flight from Memphis to Houston arrived late but uninjured after a bird struck the jet leaving the airport in Memphis, Tennessee on Sunday evening. According to passengers on the plane, the remnants of the bird were visible on the wing, although damage to the plane was not immediately visible. The flightradar24.com website tracked the flight's short path. Pilots apparently noticed the strike quickly and returned within minutes to the Memphis airport. 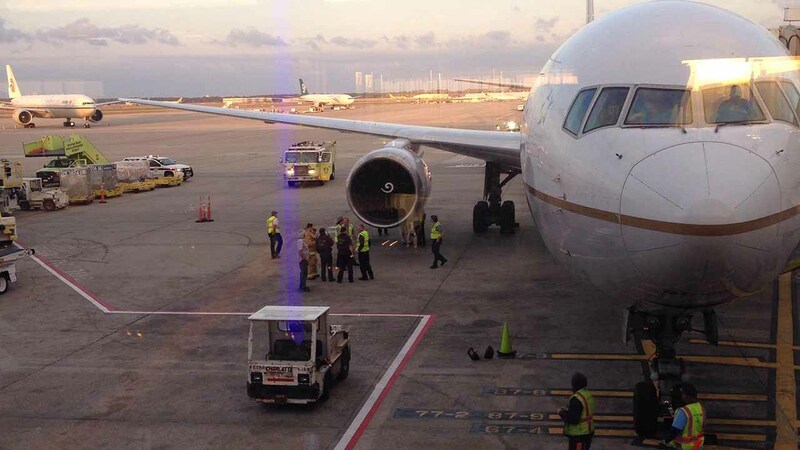 A United flight was forced to make an emergency landing Sunday afternoon at George Bush Intercontinental Airport. "Flight #486 from Memphis to Houston Hobby returned to Memphis [Sunday] after encountering a bird strike. The 118 Customers and five crew members are safe, and the aircraft is currently out of service for inspections," Southwest Airlines said in a statement. Passengers on board tell us they arrived early at Houston's Hobby Airport overnight Monday morning. 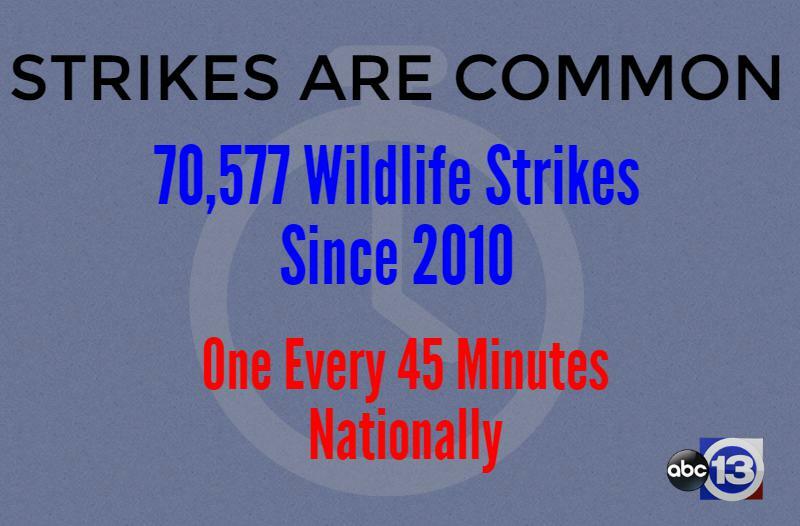 The FAA's Wildlife Strike Database shows 70,577 wildlife strikes with aircraft since 2010. It works out to one strike every 45 minutes somewhere across the country. 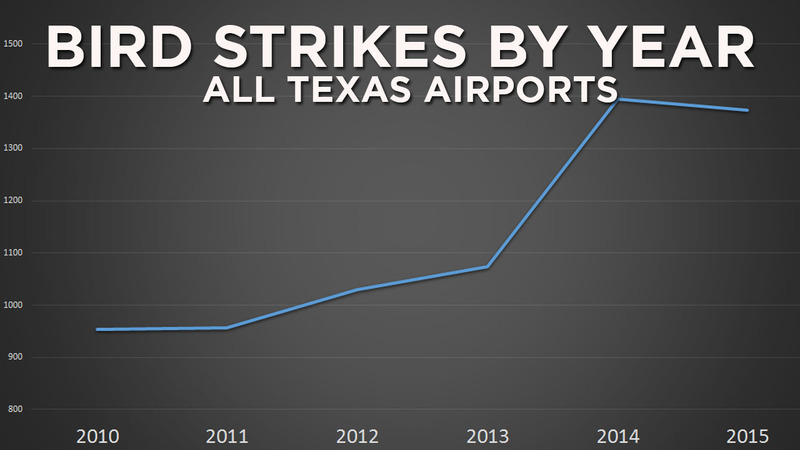 In Texas and across the United States, the database shows strikes have increased since 2010. At Houston, the Killdeer bird is the most frequent to collide with planes. Houston-area airports use loud noise cannons to keep birds away from the runways, and use of a chemical agent to deter birds was suspended years ago. The cannons, however, are apparently not in use today, and statistics may show why: December and January are the least likely months for aircraft wildlife strikes here. ABC13 Investigates crunched the numbers to see where bird strikers are most likely. The strike in Memphis is not out of the ordinary -- despite its smaller size, Memphis ranks fifth in the nation for most frequent wildlife strikes. 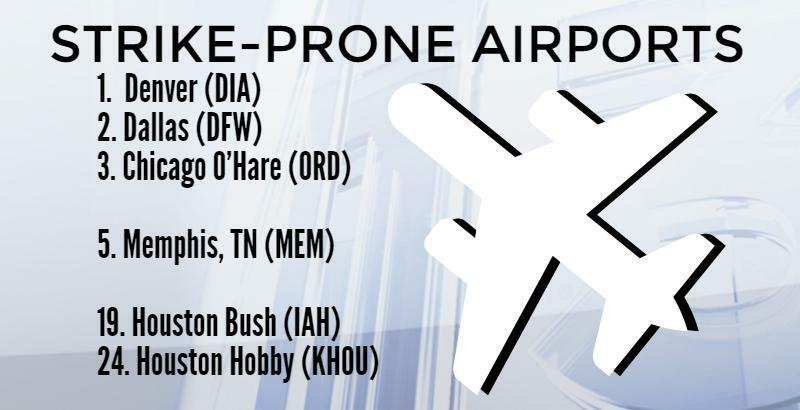 Houston's Bush Airport is number 19, Hobby 24th. 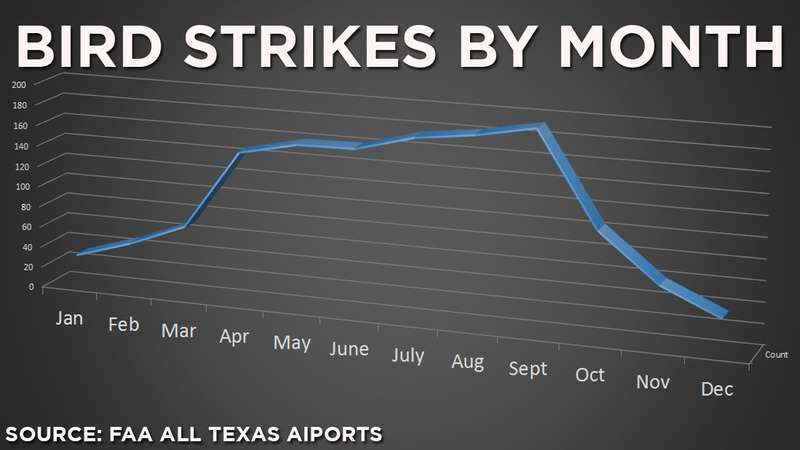 According to the FAA data, in more than 90% of the strikes, there is no damage to the plane. Only 12 aircraft were destroyed out of more than 44,000 reported incidents.